MISSISSAUGA, Ont. 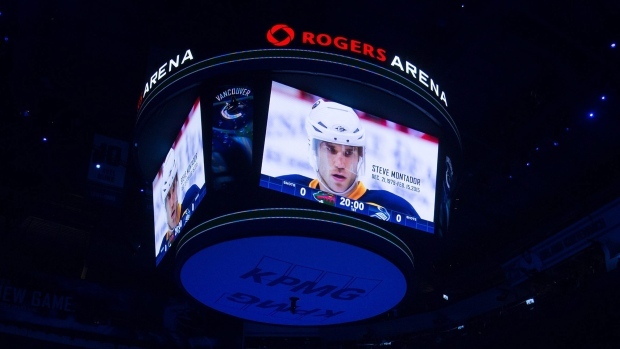 - Hundreds of friends, family members and teammates gathered Saturday to pay tribute to the life and career of former NHL defenceman Steve Montador, who died last weekend at the age of 35. "Imagine if there was a time where there wasn't hockey: You wouldn't be able to have a place big enough for as many people to come to see Steve," former Calgary Flames teammate Craig Conroy said. "If you met him one time or you played with him for 10 years, you just love him. That's the kind of person he was." In the middle of the hockey season and on a snowy afternoon, the hockey community paid its respects to a man remembered for his contributions on the ice, in dressing rooms and through charitable endeavours outside the game. Montador was remembered as a best friend and ideal teammate by many. David Clarkson of the Toronto Maple Leafs and Dan Carcillo of the Chicago Blackhawks were among those in attendance at the at the Mississauga Convention Centre, a group that also included former goalie and junior teammate Stephen Valiquette, Anaheim Ducks teammate George Parros, Flames teammates Martin Gelinas and Rhett Warrener, Canadian women's star Hayley Wickenheiser and Mathieu Schneider of the NHL Players' Association. "I think guys could've gone on for days up there," Schneider said. "It's truly amazing. I feel like I can still see him and hear his voice. He was just such an incredible, positive influence on everyone that he touched." Montador was celebrated for his overtime winner in Game 1 of the 2004 Western Conference final that was part of the Flames' run to the Stanley Cup final, for helping children in Tanzania play sports, for his work with the NHLPA and for donating his brain to science to help concussion research. "It's uplifting to see so many people come out and show their love and support for a brother that we lost," said Parros, who flew from California to attend. "It just reminds you how special he was." His coffin was brought out of the building underneath an arch created by his old hockey sticks held up by friends wearing jerseys from the many teams he played on. Funeral cards bearing Montador's face and "Monty" also featured a photo of the Vancouver native smiling during a practice with the Flames. Photos from his career and life accompanied the words of several people who were close to him. "From hearing his family talk and all the friends and everybody, you wish you weren't doing this at all, but to have the way it went, it was a touching, touching ceremony and funeral," Conroy said. "It's just one of those where one minute he's here and just at 35 is way too young."